Our brains have numerous functioning parts, all of which serve us at any one moment. But decades of research reveal the existence of two basic brain �operating systems��two fundamental ways in which the whole brain processes incoming information. Because of this phenomenon of brain dominance, most of us tend to favor the input of either our �dualistic� left-brain (which focuses on parts instead of wholes) or our holistic right hemisphere. This means that typically only half of our innate intelligence informs our thinking�and since the left-brain operating system dominates most males, our culture has itself become left-brain dominant. 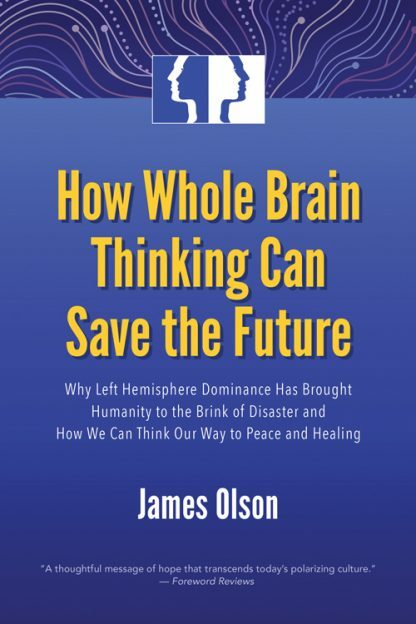 How Whole Brain Thinking Can Save the Future explores this left-brain bias in our civilization, revealing it to be the root cause for centuries of war, racism, and political polarization�and eons of misunderstanding between the sexes. While most of our technological and scientific progress is driven by left-brain thinking, the great advances to come will require that we consciously harness both sides of our brain to greatly improve our cognition. Award-winning author James Olson goes on to explain how we can achieve greater internal harmony between the two operating systems of the brain�both as individuals and as a culture�thus showing us how ad why thinking with our whole brains will lead us to peace and to the ultimate healing of our relationships and our world.